петък, 13 юли 2007 г.
четвъртък, 5 юли 2007 г. This five-person group from the Olah community is one of the most important on the contemporary Hungarian Rom scene. Romano Drom sing in their native Romanes language. They combine traditional songs with music from the Balkans, Catalonia and North Africa. Their leader is Anti Kovacs who, with his father Gojma, founded Ando Drom before breaking away. The Kovacs base much of their rhythms on onomatopoeias and the sounds they beat out of domestic utensils. 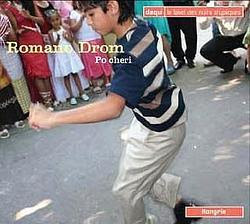 In March 2007, Romano Drom released their fourth CD, Po Cheri. While the Olah or Valachia gypsies from Hungary continue to face discrimination and division, their best-known cultural Ambassadors are “at the height” of their musical prowess. That, at least, is the literal translation of the title of this fourth album that sees the quintet reach out to the Mediterranean for inspiration. Once again Romano Drom’s music is rooted in the band’s vocal jousts that interplay with rolling onomatopoeic sounds called “szájbögözés” and “pergetés”. These mix sentences with scats to replace instruments for dance tunes. Only, this time, band leader Anti Kovacs has added foreign instruments like the Arabic derbuka, the ‘oud and the Spanish cajon. The result of this opening out is a generous album that sways from the melancholy to the festive. Po Cheri is a homage to women, to the dearly departed and to festive times. In their native language “Romano Drom” means “gypsy road” and these musicians bring us whiffs of the new horizons they have visited since their previous 2003 album Ande Lindri. They are at their most effective when they step into a melancholic mode with songs like the love tune “Numa Tu”, or two songs on the misery of Rom life, “Rodav me Muro Trajo” and “Phari Momo”.This last composition is one of two written by Gojma, who lived between 1953 and 2005. This great singer and dancer was at the heart of the revival of Olah music and culture and his premature departure has clearly marked his son Antal Kovacs Jr. Anti has returned to songs from his childhood that are rarely performed these days and revitalised them with audacious experimentations. He has also addressed contemporary issues like the negative stereotypes of Roms (“Na Som Me Chor”, or “I am not a thief”), drunken moments with friends (“Loli Mal” or “Red Wine”) and soft love invitations (“Ale Manca” or “Come with Me”).Po Cheri is thus an affirmation of the bridges that Romano Drom continue to build between their beleaguered people and the modern music scene. Hungary’s Roms are slowly using the political outlets they have at their disposal to affirm their existence. Since 2002, they have established over a thousand autonomous communities in this nation of 10 million people. Yet, the authorities in Budapest continue to divide and rule over them, leaving the Roms marginalised and impoverished. Po Cheri rings out as a defiant statement of survival and broad-mindedness, as it reaches out to music cultures both inside and outside Hungary’s frontiers. 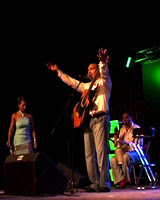 Romano Drom reflects as well the tradition and the modernity of the oláh gipsy music. The power of their traditional music is in the voices and vocal games but also the use of romani language as their mother tongue. 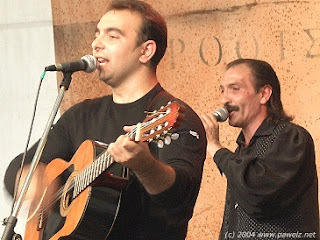 The basic olah gipsy songs are arranged by Antal Kovács who also composes new songs, mostly based on traditional melodies, and lived experiences. Romano Drom's music is characterized for its masculine energy and sincerity and it is probably the only group who has succeeded in integrating a powerful instrumentation, which gives us a sound colour never reached in this music before. Guitars, percussions, accordion, violin, and double bass groove together...until we have the feeling this music was always part of us. 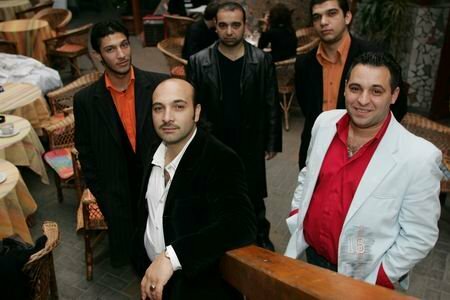 Romano Drom means "gypsy road" in romani language, dissidents of the group Ando Drom, their first album "Déta Dévla" was released in Hungary in 1999. The second album "Ando Foro" (In the city ) came out in November 2001 on the French Label daqui and is distributed by Harmonia Mundi. Their last album "Ande Lindri" (In Dream) came out in october 2003 on the same Label, and the group is actually preparing a new one coming out in the fall 2006. Anti (Antal Kovács Jr), Solo and rythmic guitar, voice He started music at 10 years old in a children's group, which later became Ando Drom. He started his carreer by dancing, then played mandolin and sang, took over the tambura and finally the guitar. Foundator of the group with his father, he does all the arrangments, composes words and music of Romano Drom. He uses Tsollar, Lovar, Beash and Romanian melodies, to create an original and personnal repertoir, influenced by his passion for spanish music, but also his interrest for arab music and even Jazz. as a very good dancer. Joco (József Balogh), Voice, guitarHe started playing music alone, waiting for the group that would suite him. His meeting with Anti is the result of a dream, and the beguinning of a warmth collaboration. Csika (Zsigmond Rafael), Aluminium can, vocal bass, danceChildhood's friend of Anti, he plays on the can, uses what we call "vocal bass", an Oláh specialilty, and interpretes the wooden stick dance.